He did it! 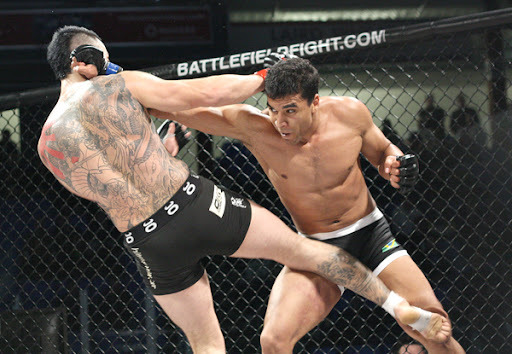 Professor Barrãozinho won his fight at Nanaimo with a rear naked choke at 1:50 of the 3rd round. It was the sickest and most exciting fight I have ever seen and my teacher did not disappoint. He straight up represented capoeira well in the ring, and proved that capoeira is a legitimate martial art! People will be talking about this fight for ages. Much respect to Ken Tran, because he showed his own skills and was definitely a tough opponent. But in the end, capoeira was victorious! Stay tuned, as video of the fight will be posted on here. Add another viral video to the capoeira collection. Congratulations to Axé Capoeira and Professor Barrãozinho!!! Update: Here are the videos. But they aren’t the best quality. The fight is still exciting to watch even though the video quality isn’t the best.